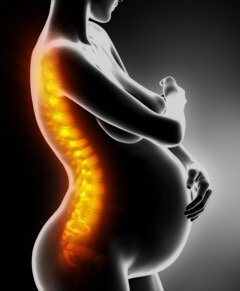 If you are experience back or pelvic pain during pregnancy, you are not alone, and osteopathy may help. Seventy-six percent of pregnant women report back pain at some time during pregnancy (4). According to estimates, seventy percent of women experience low back pain, and twenty percent suffer pelvic girdle pain (2), during pregnancy. One of the more common symptoms of pregnancy seen by osteopaths is low-back pain (7). Throughout pregnancy, a woman’s body will undergo many changes that can have an effect on daily functioning. The softening of ligaments due to the presence of relaxin, weight increase – an average of 10-12kg (5), and changes in posture can lead to additional pressure on joints in various parts of the body, including the spine and pelvis. It is important to consider the position of, and the size of the baby; as this can have an impact on the mother’s posture and movement. Osteopaths are regulated, primary healthcare professionals, who are trained in therapeutic techniques to treat a wide range of individuals, including pregnant women. Your osteopath will carry out a screening, and refer you to a doctor or midwife if necessary.